The meteorite leaving a trail in the atmosphere behind it. 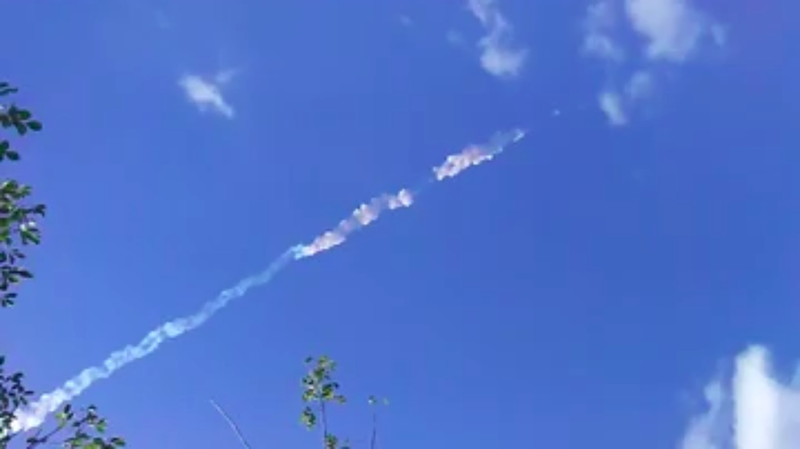 A number of impacts in 2018 exceeded last week’s, though as CNET noted, the detonation over Cuba was one of the more notable fireballs since the meteor that hit Chelyabinsk, Russia near the nation’s border with Kazakhstan in 2013. Scientists say that explosion detonated with the force of over 470 kilotons of TNT, or nearly as strong as the MK-18 “Ivy King” in 1952, the largest pure-fission bomb ever tested by the U.S. at 500 kilotons. According to a Tulane University fact sheet, the Chelyabinsk object was probably around 56-65 feet (17-20 meters) in diameter. The object that exploded over Cuba was likely much smaller, probably around the size of a van. Cuban media reported that locals found what they believed was what remained of it after it burned up in the atmosphere in the form of small, black rocks around the size of a mobile phone. Only minor property damage such as shattered windows—probably from the sonic boom generated by the object surpassing the speed of sound—was reported to have resulted, with no injuries.